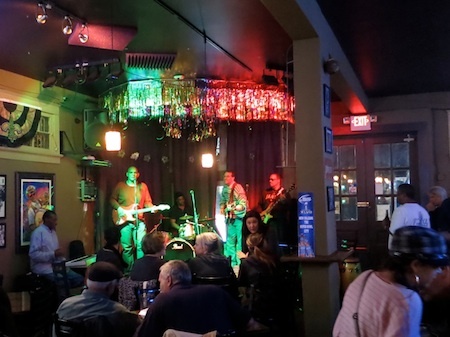 A guy in a ski sweater is on stage at d’mac’s Bar & Grill (542 S. Jefferson Davis Parkway, 304-5757), taking a pristine, vintage Gibson guitar on an extended blues rip. Later, a shy-looking woman in Chucks and a sweatshirt breaks into Etta James’ classic “I’d Rather Go Blind” and the noisy room goes speechless. A man built like Ray Lewis croons through a Sam Cooke medley, which inspires his buddy to leave his conga drums and harmonize with him at the mic. And that guy in the sports jacket with the long gray hair, the guy who’s standing on his chair and wailing on a harmonica? Word goes around the bar that he once played with Al Green, and the harmonica goes into “What’s Going On” as if to confirm the rumor. I’m not sure if all of America does indeed “got talent,” as that oddly-named network TV talent show suggests. But after witnessing a few editions of the Monday night blues jam at d’mac’s, I have no doubts about the rich seam of unheralded talent around New Orleans just waiting to be called up on stage. This weekly blues jam is not really an open mic night, but more like a show-and-tell of musical richness, orchestrated by host Danny Alexander and his band. They set the pace, supply the rhythm and drive the show. You don’t get any nervously rambling stories from aspiring singer/songwriters or extended tuning sessions by novice players between numbers. Rather, the people who turn up for this remarkable yet low-key Monday night gathering take their turns on stage like pros with finely-honed chops and no pretensions to grandeur. For those of us assuredly without musical talent, part of the fun of these evenings comes from watching the show unfold as the room reveals its surprises. D’mac’s sits by a crossroads, near Jeff Davis Parkway and Tulane Avenue, and it’s a nice addition to a part of Mid-City undergoing a rapid revamp. Before Katrina, the bar here was called the Delta Blues Club, a dump that was also one of the most convincingly funky music halls in the city. The music line-up often included marquee names like Walter “Wolfman” Washington and Marva Wright, and the place drew an amazingly mixed clientele with pool sharks in the back, old ladies in sequin dresses boogieing on the dance floor and studious music heads and neighborhood drunks perched together around the bar. The Delta Blues Club never reopened after the storm, and the address was home to a string of weird and short-lived watering holes. But now it seems to be getting some of its old groove back, albeit in a little more polished fashion. About a year ago it was reopened by David McGee (that’s d’mac to you and me). He’s in the construction business and he and his partners gave the teetering old building a much-needed renovation. Today, it’s an attractive, well-kept, 24/7 operation with a decent draft beer selection, a gleaming new tavern kitchen serving burgers, pizzas and daily specials and live music nightly. Lynn Drury is in regular rotation here, and she’s playing tonight, Jan. 23, at 9 p.m. with Alex McMurray. Look for a lot more from d’mac’s as its music scene develops. And on Mondays, look around the room and try to guess who will get called up next and what they’ll bring to the party. The Monday blues jam begins at 8 p.m.